This easy appetizer is the perfect thing to throw together for any type of get together! Only six ingredients, this showstopper is really taken over the top when paired with some crispy, pan-fried gnocchi. These are not your average nachos. In fact, they’re hardly nachos at all. There are no corn chips in sight, there’s no gauc to be found and chili powder is the last thing you’ll ever find on the ingredient list. Yet, dare I say it, these may be your most favorite not-nachos nachos ever! 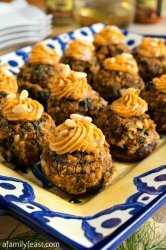 Our Tuscan Stuffed Mushrooms will be a delicious addition to any holiday meal or a delicious appetizer to serve at a holiday cocktail party. Herbed Stuffed Mini Sweet Peppers- just 3 ingredients and 15 minutes for a flavorful appetizer that everyone will love! 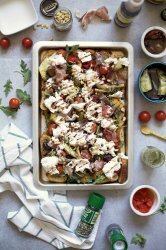 This elegant looking Tapenade Tarte Soleil with Pine Nut Marscapone recipe can actually be whipped up in under and hour and is sure to be a crowd pleaser at your holiday feast or cocktail party! This DIY balsamic fruit crostini platter is so simple, but incredibly flavorful. It's a refreshing change from cheese or crudite platters. Alessi's balsamic reductions can give simple, everyday foods an easy pop of flavor. These quick and EASY garlicky pesto flatbread pizzas are full of fresh tomatoes, basil and arugula for a flavorful weeknight dinner that can be ready in just 15 minutes! Butternut Squash Stuffed Portabello mushrooms are a delicious and easy appetizer for your next party! Looking for the comfort of spaghetti and meatballs without all the downsides? Look no further than Farro Wheatballs with Spaghetti Squash! Delicious enough so you can't tell the difference, but you'll feel great after eating it too! 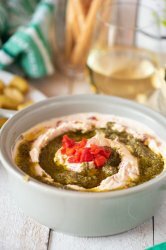 If you love Greek inspired foods, you're sure to love this recipe! 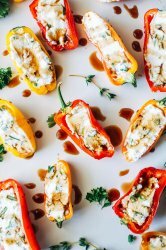 A Greek twist on traditional stuffed peppers makes these a unique and delicious side or meal! Zucchini is the perfect complement to Alessi Farro. This recipe for stuffed zucchini is packed full of so much flavor, you'll cook it over and over again! A great addition to fish, hummus or on top of Alessi Toast!